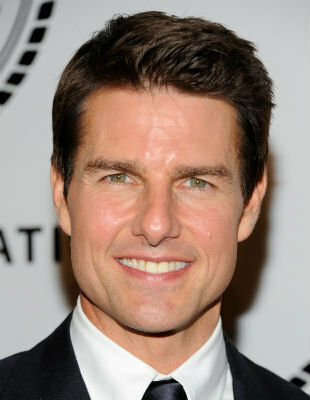 Tom Cruise has been named the highest-paid actor in the USA, earning $75 million (£47.9 million) between May 2011 and May 2012. The actor, who has just split from his wife Katie Holmes, beat his nearest two rivals by a huge $38 million (£24.2 million). Leonardo DiCaprio and Adam Sandler were easily beaten into second and third place, having earned the substantially smaller figure of $37 million (£23.6 million) each in the same period. Though Cruise's last film 'Rock of Ages' proved a box office flop, it's thought he made a substantial amount from 'Mission: Impossible: Ghost Protocol' which earned more than $700 million (£450 million), with Cruise in for a share of the profits as well as his fee. Business magazine Forbes published the list of earners, using figures including pay upfront, share of profits, endorsements and advertising work. The high earnings come at a precarious time for Cruise. In the state of New York, for example, a figure of 17% of a couple's income is set aside for child support during divorce proceedings, with each person paying a proportionate amount, meaning that Holmes and their daughter Suri could be in the frame for a potential $9 million (£5.7 million), according to Forbes.